The Holigost – or Holy Ghost – was one of four “great ships” commissioned by the king in his war against France. It was spotted in an aerial photograph by historian Dr Ian Friel, in an area of Hampshire’s River Hamble described as a medieval breaker’s yard. Historic England said it was a “tangible link” to Henry V.
The Holigost fought in sea battles during the Hundred Years War which broke the French naval power. 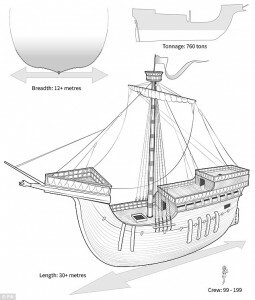 Future scientific research on the ship, which could include sonar and aerial imaging using drones, could reveal much about 15th Century shipbuilding and improve understanding of life aboard ship, naval warfare of the time, dock building and docking practices. Historic England said it was taking steps to protect and investigate the shipwreck in part of the river next to where Henry’s flagship, the Grace Dieu, was identified in the 1930s.